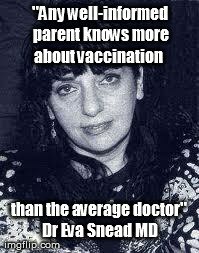 "Vaccinations, The Untold Truth," Yves DeLatte, Edited by Eva Snead, M.D. "Some Call it AIDS: I Call it Murder The Connection Between Cancer, AIDS, Immunizations, and Genocide" Eva Lee Snead, M.D. Immunization Related Syndromes," (video) Eva Snead, M.D.